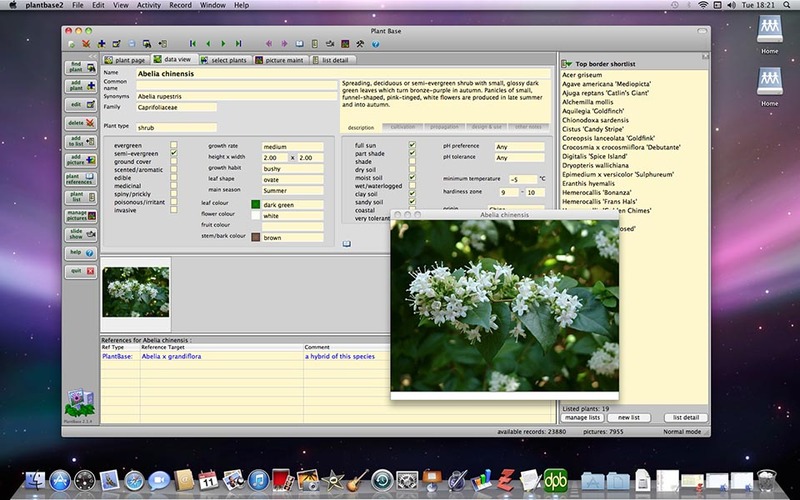 There is now a native Plant Base application for Apple Mac OSX systems. This edition is based on the Windows program and has all the same features. It uses much of the same code but adapted to suit the Mac OSX environment and is a fully native application for OSX 10.6 or later. No emulation is used and it's a totally stand-alone product with no other software dependencies - just the same as the Windows edition. An important concept of Plant Base 2 is that the database files are the same on all platforms, not only their data content but also the file format. So they can simply be copied between Mac and Windows machines, in either direction without needing any kind of conversion. Our recources for development and testing on the Mac platform are more limited than others. Development is done on quite an old release of Mac OS, as this gives the best possibility of compatability with the widest range of customer machines. We cannot guarantee the application will run correctly on all systems, so please take advantage of the free trial period. The full product download file is a normal Mac "dmg". Inside there are two folders, one for the application program itself and the other for the data files. Full installation instructions are also provided. The application folder can be copied into the usual Applications system directory or an alternative location. We recommend that the entire application folder is kept as supplied, as in addtion to the app package it also holds the help and language files. The data folder can be placed wherever the user chooses, for example under the user's Home directory would be typical. The location of the data files may need to be given at the start of the first run. Initially new installations will run as a 20 day trial. Further use requires entry of a licence code. This licence code is exactly the same for both Windows and Mac editions. Existing Windows customers can simply use their original code. New users will need to purchase a licence code, valid for both Mac and Windows. Important :- Plant Base is not currently available from the Apple Store and is not digitally signed with an Apple developer identity. On Mac OS Mountain Lion or later your system may therefore complain about installing it. However, you can enable installation by adjusting the Security & Privacy setting in System Preferences. This can be reset to the original value immediately after installation if you wish. For the MacOS Sierra release and later the procedure for non-store apps is slightly different - best to search the Mac support forums for the method and full explanation. We don't yet have, or need, an official Apple Developer id since the Plant Plant application is not coded using Apple's programming language and is the single product we make for the Mac. This may change in the future. Plant Base for Mac is written with exactly the same independent cross-platform programming language as the Windows edition and forthcoming Linux version - PureBasic from Fantaisie Software (www.purebasic.com). You can safely download the full installation file from the Downloads page of our own website. If you obtain an installation file from any other source, please be very careful! Some software indexing websites may list it and most are perfectly legitimate. Never, ever, use any site that offers a download that includes a licence code or 'crack'. If you have any concerns about running Plant Base on your Mac, please contact us and we will be happy to answer any questions about it. Mac and OS X are trademarks of Apple Inc. Windows is a registered trademark of Microsoft Corporation.